So I am supposed to be a good student and be writing two papers at the moment, but just can’t get in the mood to do so. My mind keeps drifting and dreaming of adventures as I reflect on the past few days. 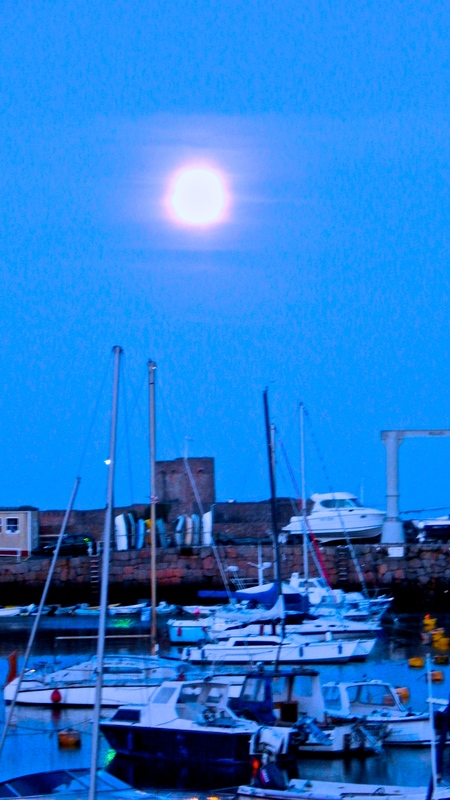 I am sitting on the patio of the Somerville Hotel, sipping a cool cider and looking out over St. Aubin’s Bay in Jersey. Tonight delivered another amazing sunset; even without the sun, the bay is still fairly bright and definitely active this Sunday night. The past three days flew by much faster than I anticipated they could and I will be sad to leave this wonderful island tomorrow afternoon. I initially came here to see Mont Orgueil and research its evolution over time. I will be incorporating the castle into my larger project on the evolution of castles in the British Isles. Anyway, a girl can’t be solely about work without any play, so I decided to make this trip a mix of work and pleasure. I was definitely hitting that burnt out; I am tired point during the summer semester and needed a break. Jersey didn’t disappoint in providing exactly what I needed to recharge and get inspired again. I rode the bus around the island, explored its shores and hills, shopped in St. Heliers, and enjoyed what the place has to offer. Maybe I am just lucky, but the weather has been gorgeous my entire stay making the water bluer and the place magical. My first day on the island was about serious academic endeavors. I dropped the luggage off at the hotel, caught the next bus to Liberation Station, purchased a 3-day bus pass and headed straight to Mont Orguiel. This 13th century marvel captured my academic side and the writer in me immediately. Part of me is still seriously thinking I need to set my next novel here. (You know me and knights in shinning armor with swords. I could easily envision mighty sea battles in the Channel/bay being viewed from the watchtowers by anxious castle residents.) I digress; let me get back on task. As you’ve probably already guessed, from the tops of the walls and gatehouse, one is treated to spectacular coastal views of turquoise water contrasting against dark brown rocky shores. The castle has a great story spanning from 1204 until today. 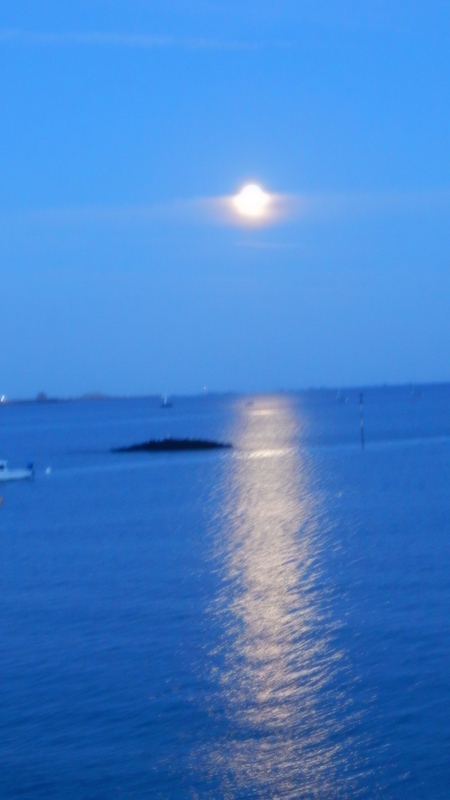 One could see how the stronghold defended the Jersey shores from foreign invasion. 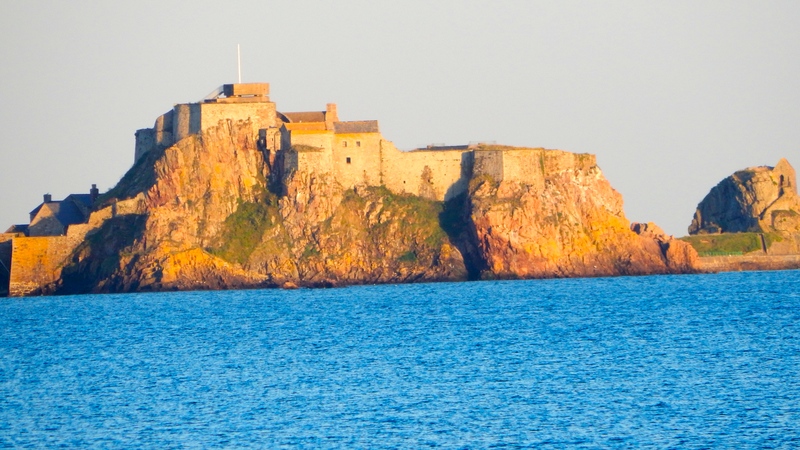 Jersey has Norman heritage and belonged to the Normans prior to formally becoming part of the British Isles. Sadly, Jersey had to decide whether to stick with their Norman linage and side with King John or side with the French mainland after John lost his French territories to Philip, the King of France. 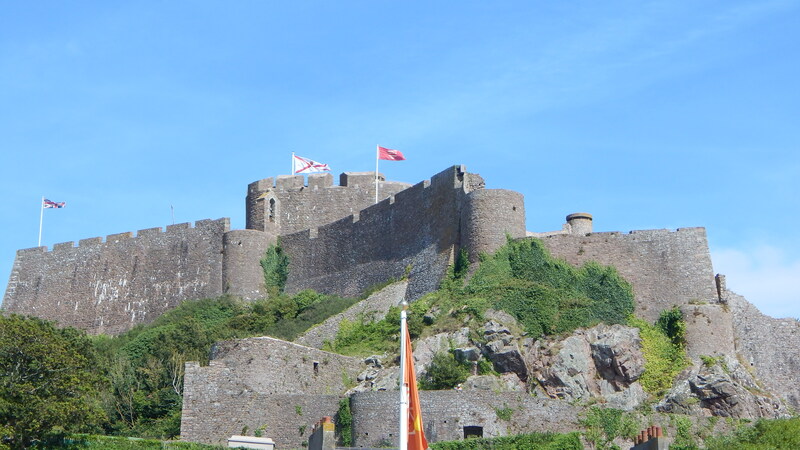 Per the castle video created by the Jersey Heritage organization, the island chose to award its loyalty to King John and England. Per other sources, the king only surrendered his rights to Normandy and always retained a claim to the islands without input from the people of Jersey. I will let you decide what actually happened. Either way, Jersey became a crown territory with rights to self-government. When it comes to cuisine, this little island packs quite a punch. There is not a single type of cuisine I could not find here. I ate local dishes, Thai, Italian, English, North African and French fare. Yes, I am counting breakfast and snacks in there. I am not that much of a glutton. 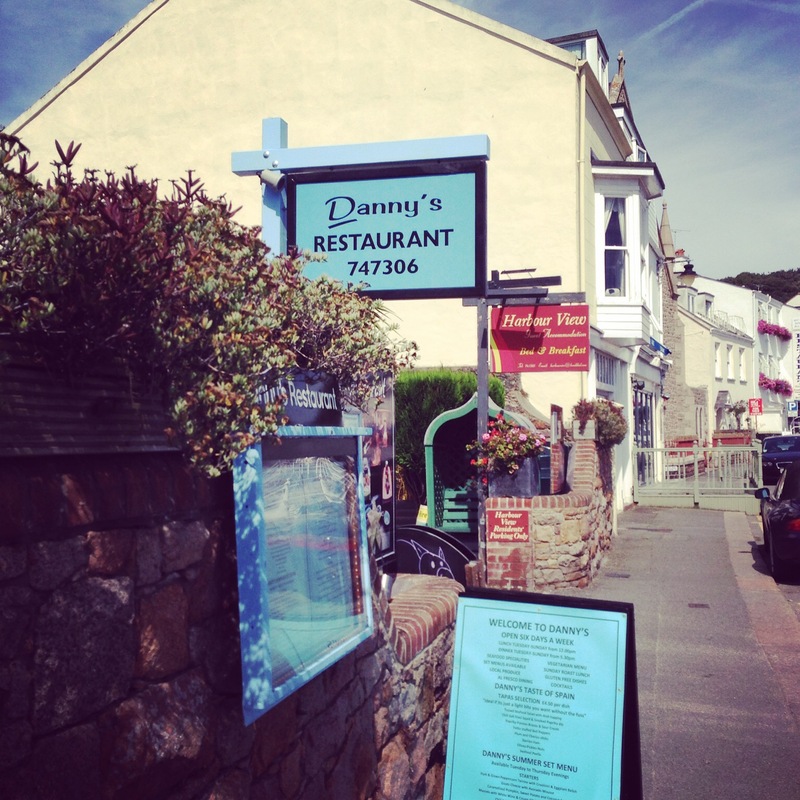 My all time favorite restaurant is Danny’s in St. Aubin’s. It is a come as you are and enjoy some flavorful dishes place. The menu offers everything from tapas to very filling main courses. One night I had baked Jersey lobster with royals (Jersey potatoes) and a salad. The next night I had lamb rump in a yummy Moroccan Tagine sauce with date couscous and a starter of artichokes and figs. I would recommend either meal to anyone. If you fall in love with the dishes and want to attempt to recreate Danny’s masterpieces at home, they do sell a cookbook for 5 pounds. The locals are warm and welcoming. On the bus and in my wanderings, I had the opportunity to converse with a large number of folks. All were friendly and quick to share island history, offer recommendations for sites to visit along with places to eat, share their stories, and talk about the weather. At the historical sites, Durrell and in specialty stores, employees quickly answered questions and educated customers on the location and the products or work being done on site. On a lighter note, Hollywood and Chuck Norris are keeping the stereotype of us Texans alive and well here on the island. One individual I met declared I couldn’t be a Texan as I didn’t have any boots or a cowboy hat. After watching Walker Texas Ranger, he passionately believes that no good Texan is without either item. I had to tell him I left the boots and hat at home. Thank you Hollywood and Chuck Norris for continuing the age-old image of Americans as cowboys overseas. I may have to add Jersey to my fall case studies in American branding: what we think we export versus what others actually perceive us to be. In defense of the locales, I suspect the individual was well into his cups, but he wasn’t the only one to ask me about a hat or rodeos. This post is getting long, my cider is almost gone and I have more thoughts to get together on Jersey. Long story short, Jersey is fabulous! If you have room in your travel itinerary or are looking for a unique place to visit, Jersey certainly fits the bill! You will have no regrets in deciding to come here. I will highlight a few of the sites in future posts to further peak your interest.